There's always been this desire by a certain generation of Spider-Man fans to see the web-slinger's villain, Venom, portrayed on the big screen in the effortlessly cool yet terrifyingly fun way he was presented in both the comics and the nineties animated series that devoted an entire stretch of episodes to the Stan Lee and Avi Arad-created story titled "The Venom Saga". Venom's popularity has always been about little more than how "cool" the character looks as there is little else of actual depth to the character beyond the fact it's a sludge from space that requires a host to bond with for its survival. In the comics, Venom became most notable as one of Spider-Man's archenemies after Peter Parker realized the insidious nature of what was referred to as the "symbiote" and trashed the suit only for the symbiote to then join with a second host: Eddie Brock. In the animated series Brock was a well-meaning guy looking for his big break who just so happened to view Parker as a rival reporter. Needless to say, in joining with the symbiote and becoming Venom Brock inherited the alien's enhanced abilities and felt a power for the first time in his life he wasn't going to readily give up. So, one can see how-despite the rather artificial intrigues of the symbiote in and of itself that-once this liquid-like form joins with a human host who has their own personality and problems things might become more complicated and therefore more dramatically interesting, right? Well, consider that and then consider the fact director Ruben Fleischer (Zombieland, Gangster Squad) and screenwriters Jeff Pinker, Scott Rosenberg, and Kelly Marcel only have about half of those source material ideas to work with in order to create a full-length feature around the character. This is what 2018's Venom was tasked with and thus why it turns out to be a mostly forgettable B-monster movie made in the vein of Sam Raimi's original live-action Spider-Man, but with none of the fun or genuine thrills that movie packed in. It's a re-purposed Spider-Man origin story, but with a symbiote instead of a radioactive arachnid where the individual blessed and/or cursed with these powers has to figure out how to control them and then decide how to use them for good. 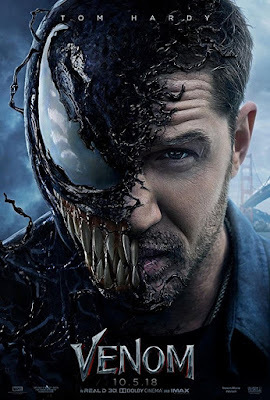 Seriously-Venom, the symbiote, likes to bites heads off, but Tom Hardy's Eddie Brock is an out-and-out good guy with no shades of moral conflict leaving the film itself to not be the interesting anti-hero tale it billed itself to be, but instead feels like a recycled Spider-Man movie from an alternate universe where the symbiote was brought to a world where Peter Parker doesn't exist (at least for the time being) and the titular character becomes by default the hero of the story. In other unfortunate words, Venom adds nothing to these tropes audiences have seen countless times over the last two decades, but is all the worse for it due to the promise of being a real scoundrel's story. Anne (Michelle Williams) dumps fiancé Eddie Brock (Tom Hardy) after he violates her trust in Venom. It's a mystery how long this Venom script has been lying around-probably since around the same time Raimi's Spider-Man 3 came out in 2007 and Sony and Columbia were hoping to cash-in on a Topher Grace spin-off starring the character. Hell, maybe it hasn't even been that long-maybe it's only been gestating since the second Spider-Man re-boot failed in 2014 when Sony was mapping out a Sinister Six cinematic universe that would no doubt include the symbiote at some point in the game. Whether the script has been passed around for ten years or five years though, the point is the same in that this thing feels as dated as it looks. Venom begins, as many of these things do, in the cosmos where a shuttle that is the property of the LIFE Foundation as run by the evil Carlton Drake (Riz Ahmed) is on its way back into the earth's atmosphere with samples of these symbiotic life forms aboard. Also as these things do, one of the symbiotes is tired of being contained and breaks free causing the shuttle to crash land in Malaysia allowing one of the samples to get away. The other samples are returned to the LIFE Foundation's San Francisco headquarters where Drake and his team of top scientists, including Jenny Slate's Dr. Dora Skirth, can begin conducting tests with the goal being to figure out how humans might one day inhabit other worlds given the human race is less than a generation away from destroying earth. Not so much a coincidence is the fact Eddie Brock has been run out of New York, for reasons that are never explained, and now resides in the Bay area with fiancée Anne Weying (Michelle Williams) while working as a well-renowned investigative journalist for a network that has given him his own show. Brock's bosses have booked an interview with the mostly reclusive Drake who needs to get ahead of the PR fire surrounding his shuttle crash and naturally Brock is tasked with the interview while being warned to stay on script and focus on the space shuttle scenario. Brock can't help but to go rogue though, and lucky for him Weying just so happens to be an attorney whose firm was contracted by Drake's company to assist in the legal matters dealing with the shuttle crash and Brock sees no issue with hacking into his fiancée's laptop and viewing classified documents that lead him to confront Drake about what is really going on behind the sleek and optimistic facade his company presents. Drake, being the powerful man that he is, not only gets Brock fired, but Weying too. This betrayal of trust leads to a break-up which by default leaves Brock with little of his former life and thus the reason he's both intrigued and terrified when circumstances that are actually beyond his control bring him face to face with a symbiote that finds him to be a compatible host. Here's the thing with Venom though, it's not necessarily a weird enough movie to be called weird by virtue of what it presents on screen, but it's weird by virtue of the fact that it exists at all. There were numerous moments throughout the movie where I had to stop and laugh not for the fact of what I'd just experienced being so bonkers, but because I couldn't believe I was actually watching a $100-plus million production of a Venom movie. The fact this is where we're at-not that Guardians of the Galaxy or even Ant-Man didn't feel this way to a certain degree, but they were still whole properties in and of themselves-in that we're at a point where properties are being tapped to the extent extraneous characters from those properties are becoming their own properties independent of the brand they were once considered to be a part of feels both strikingly exciting and desperate. As with all things, it depends on the situation and in the case of the final product that Fleischer, Hardy, and co. have delivered this is one of those situations where nearly every aspect wreaks of desperation. That is to say, it seems the team behind this wanted to and intended to make a rather interesting comic book movie that teetered the line between campy buddy comedy and a melodramatic actioner (and if that sounds odd, trust me it really goes for that combo), but while Venom can be really fascinating in individual instances and absolutely nuts for long stretches none of it is ever fun enough to make it even the least bit memorable. Know also that if you remain in your seat hopeful for a trademark (in association with) Marvel post-credits scene you'll get what is absolutely one of the worst post-credits scenes of all time. The best of these bonkers moments though, come from the interplay between Hardy as Brock and Hardy as Venom as it seems the actor took this role strictly for the fact he might both have the opportunity to conduct conversations only with himself for large portions of the running time as well as to be able to cover his face for a fair amount of the movie. Once the movie trudges through all of the exposition as laid out in the previous paragraph and reaches the point where the symbiote finds Brock and Brock has to figure out what the hell is going on inside him things then give way to a Hardy performance that is as manic and, by default, as comedic as anything we've seen from the actor. The first hour or so of the film wades strictly in the melodrama with only occasional bursts of action and a tone far too serious for what we're about to witness for as soon as we get dual Hardy covered in CGI space goop we get that buddy comedy that literally involves Brock and Venom working through their differences to become pals which extends to Weying's new doctor boyfriend, Dan (Reid Scott), along with Academy Award-nominated actress Michelle Williams genuinely delivering a line that reads, "Hey, I'm sorry about Venom." 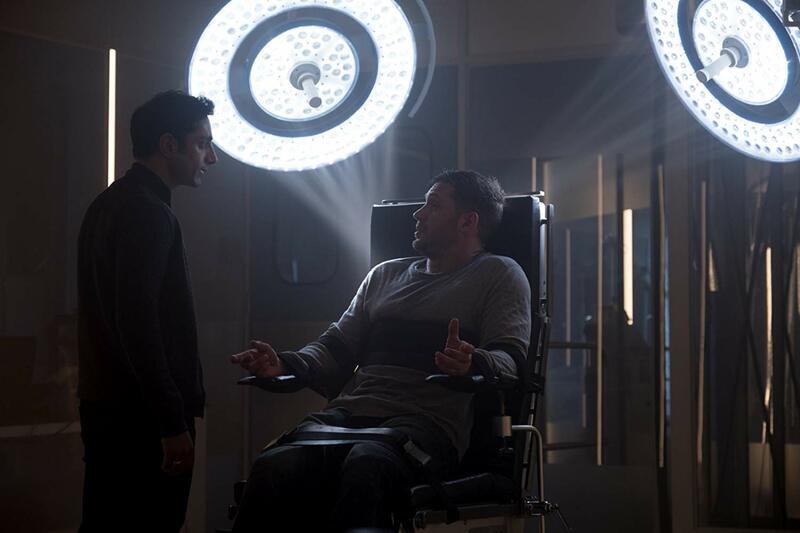 Carlton Drake (Riz Ahmed) will stop at nothing to recover the symbiote that's made Eddie Brock its host. How much of what is laughable is intended is the question that will forever surround Venom. It would seem Williams would be delivering a line like the one mentioned above in jest, but in the context of the scene in which she throws it out there it's almost as if the film expects the audience to feel an authentic sense of loss and pity for Brock even though the forthcoming reveal is beyond obvious. This is also the case with the now infamous "turd in the wind" line, but again-in the context of the movie-it's difficult to tell whether or not this was meant to be mostly terrifying with a slight hint of charm or if Hardy is completely winking at us; it's so hard to tell with all that stuff on his face. Speaking of the CGI there are a handful of moments where as much is convincing; namely in the scene in which Brock first experiences the power the symbiote has entitled him to where a group of mercenaries bombard him in his hotel room in an attempt to recoup the specimen. There is also a moment in the climactic battle between Venom and Drake's symbiote alter ego, Riot, where the two symbiotes and their hosts are bound together while fighting to remain the dominant species. It is in these scenes that the melding of Hardy's performance, the special effects, and the action are cohesive and deliver an authentically cool fusion of every element the movie is throwing at the wall. And then there are times when the CGI looks iffy at best, where action scenes are hastily cut and pasted together (I'm looking at you, motorcycle chase), and one performance seems so completely out of tune with another. This is largely true when it comes to the contrasting approaches of Hardy and Ahmed who seem to be in two completely different movies with Fleischer apparently having no idea how to guide either of them to the tone of the other. A hazy hue also hangs over the film which makes it look as if it were shot in 2002. This choice in aesthetic is puzzling as Matthew Libatique (The Fountain, A Star is Born) is one of the most prominent cinematographers working today, but his touch here only adds to the films already dated feel and if your movie, which features a completely CGI creature, already looks dated on opening weekend it's not hard to imagine how rough this will appear in a few years' time. Venom is a movie that needed more attention paid to the special effects than it did craft services and while I wasn't on set I'm willing to bet those spreads were more aesthetically pleasing than what Fleischer and Libatique have served up here. It was always difficult to be optimistic about a solo Venom project even with the casting of credible talents like Hardy, Williams, and Ahmed, but there was hope that this experiment of a movie might find a way to find a purpose and convey something compelling in the realm of exploring this bodily transformation experience, integrated with the infection and technology aspects, and all of the intertwining psychological and physical elements that might go along with it. Alas, Venom is more an abnormality than it is a true experiment for, at the end of the day, the film seems to have no idea why it's being executed and therefore no idea what to do with itself.